If you have suffered a whiplash-type injury to the neck, chiropractic care is a good choice to reduce pain and return proper mechanics to the cervical spine. To understand the chiropractic treatment of whiplash injuries, it is important to briefly review the nature of this type of neck injury. Whiplash is characterized as an injury to the muscles of the neck from the traumatic rapid forward and backward motion of the neck during an accident. 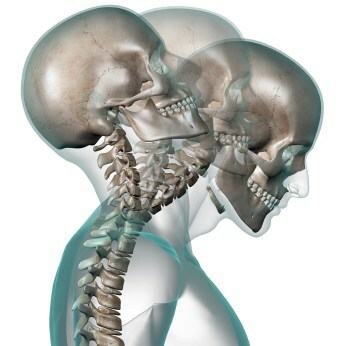 Chiropractic emphasizes a comprehensive picture of the mechanisms of neck sprain. As important as muscle injury is the response of the nervous system to trauma, and the injury to deeper tissues of the spine with resulting restriction or fixation of spinal joints. The acute pain and restricted motion you experience after a whiplash injury is a product of injured tissue, and the protective response of the nervous system as it locks up spinal joints to protect you from possible injury to the spinal cord. Chiropractic care emphasizes mobilizing restricted spinal joints and initiating rapid firing of neurological receptors using spinal manipulation, including non-force and flexion-distraction techniques. Your chiropractor will address the disturbed mechanics and the neurological responses that allow for treating the cause of neck injury and return a full functioning to injured spinal joints. It is important to emphasize that spinal manipulation is introduced by your chiropractor only when the initial traumatic muscle injury is stabilized. Your chiropractor will be using various types of treatments depending on the stage of your whiplash injury. Shortly after the injury, in the acute phase, the chiropractor will concentrate on reducing inflammation with therapy modalities, such as ultrasound, and, if indicated, gentle stretching and manual therapies, such as muscle energy therapy. Ice will be recommended and sometimes a light neck support might be prescribed for a short period of time. As the neck begins to be less inflamed and acute, the chiropractor will utilize gentle spinal manipulation, or adjusting, in order to return motion to spinal joints that have locked up and become restricted as a result of the injury. In some patients, non-thrusting and non-force methods are more appropriate, including Cox flexion-distraction technique. Chiropractors are doctors who specialize in the care of non-surgical conditions of the neck with gentle, time-saving approaches that address the mechanical and neurological causes of whiplash injury. Chiropractors are rigorously trained to diagnosis the different types of neck injuries. Your chiropractor will take an extensive history and provide a comprehensive examination to determine what tissues have been injured in an accident and what spinal joints may be restricted in motion. The goal of chiropractic care in treating whiplash injuries is to optimize motion in the spine, treat the spinal discs, reduce muscle spasm and improve muscular strength. Chiropractors are specialists in spinal manipulation—an active, hands-on care that returns motion to the spine. The restricted motion and disturbed mechanics that characterize whiplash injuries are especially helped by spinal manipulation in patients who are considered good candidates for this approach. Even if you go to the chiropractor complaining of neck pain following an accident, he or she will evaluate your spine as a whole. The chiropractor will check your neck (cervical spine), mid-back (thoracic spine), and low back (lumbar spine). It’s important to examine the entire spine because even though it’s just your neck that hurts, other regions of the spine may be affected. Your chiropractor will determine areas of restricted joint motion, disc injury, muscle spasm, and ligament injury. One way the chiropractor does that is through motion and static palpation, diagnostic techniques unique to chiropractic. Motion and static palpation is an examination by means of touch. The chiropractor will feel for tenderness, tightness, and how well each spinal joint moves. The chiropractor will also analyze how you walk and look at your overall posture and spinal alignment. Those details will help your chiropractor understand your body mechanics and how well your spine is working and moving. You’ll also go through your past medical history with the chiropractor. Your chiropractor will have x-rays of your spine taken to evaluate possible degenerative changes, or an MRI if it is indicated. After the examination, the chiropractor will be better able to create an effective treatment plan for your neck pain. Possible Chiropractic Treatment Approaches for Treating Whiplash Injuries The exact treatment plan depends on your diagnosis. Your chiropractor may use a type of spinal manipulation, or spinal adjustment, to improve joint motion and soft tissue health. Chiropractors are “whole person” doctors who view neck pain as unique to each patient. Therefore, they don’t focus on just your neck pain. Chiropractic care includes nutrition, stress management, and lifestyle goals (because all of those can add to neck pain, so you need to address them if you really want to relieve your pain). Chiropractors emphasize prevention as the key to long-term health—another example of chiropractors looking at the whole person, not just the painful problem. Keeping the neck and back healthy is vital to the chiropractic approach to care. A chiropractor will help you return to your normal activities quickly so that you can enjoy your daily life without pain. He or she will work to address the underlying mechanical (how the spine moves) or neurological (nerve-related) causes of your whiplash injury.